Over the past 2 years we have been very involved in fibre-optic cable installation. of the FTTH (Fibre To The Home) and FTTB (Fibre To The Business) industry in the installation of OVERHEAD and UNDERGROUND fibre-optics for broadband, television and telephones. The fibre-optics industry is rapidly increasing in importance and with satellites reaching saturation fibre-optics is becoming crucial. FTTH is also gaining in importance since it will negate the ‘freezing’ of the system as experienced with some cable systems. We have experience in the installation and measurement of FTTH and FTTB. We are not designers but we have the knowledge of the design system, assessing what has been designed and reporting to the contractor. We can measure from the drawings giving a forecast of what will be expected from the contractor. We have experience in the reciprocation of the system so if the system fails in an area the back-up to the system means that everything will not crash, and clients can continue with their service while it is repaired. 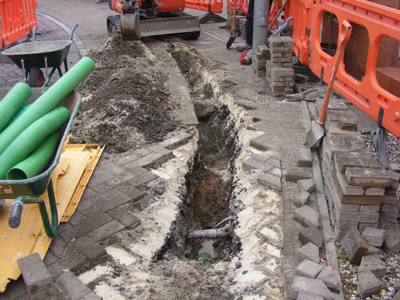 We have experience in the laying of the fibre-optics (both overhead and underground), the splicing of the systems (and their monitoring and presentation) and the final connection into the box at the house/office/multi-dwelling unit.